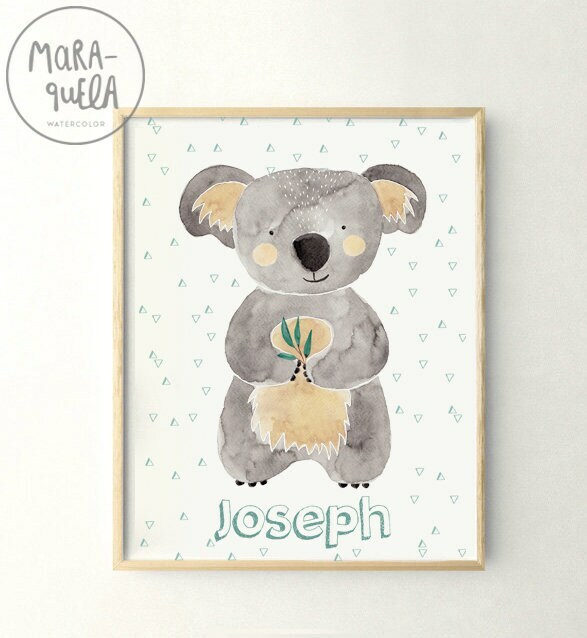 • Lámina Koala, ilsutración infantil en acuarela y personalizada con nombre (opcional). 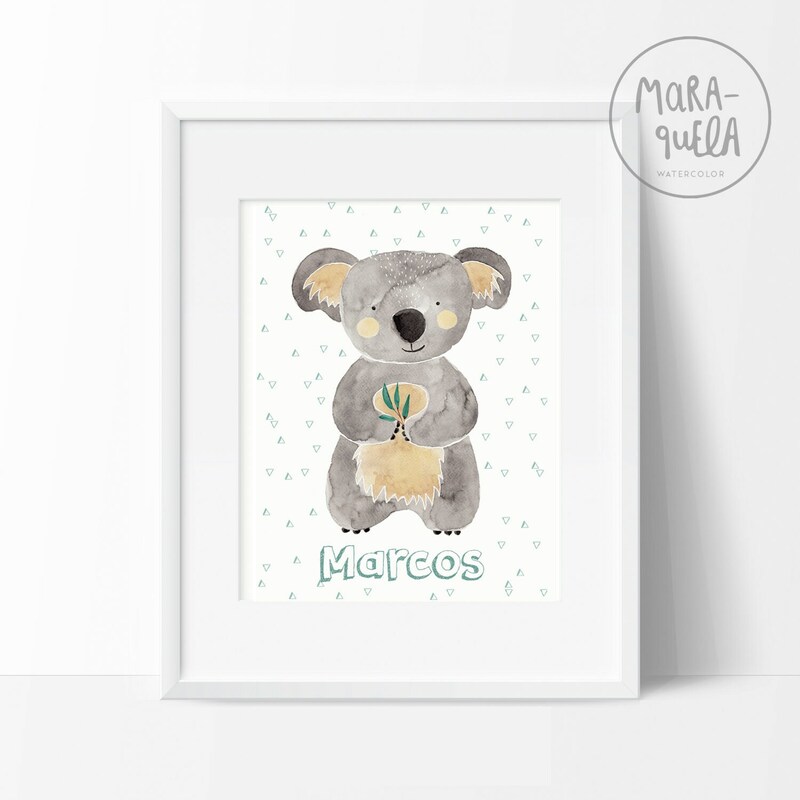 • Con bonitas tonalidades de gris y verde azulado. 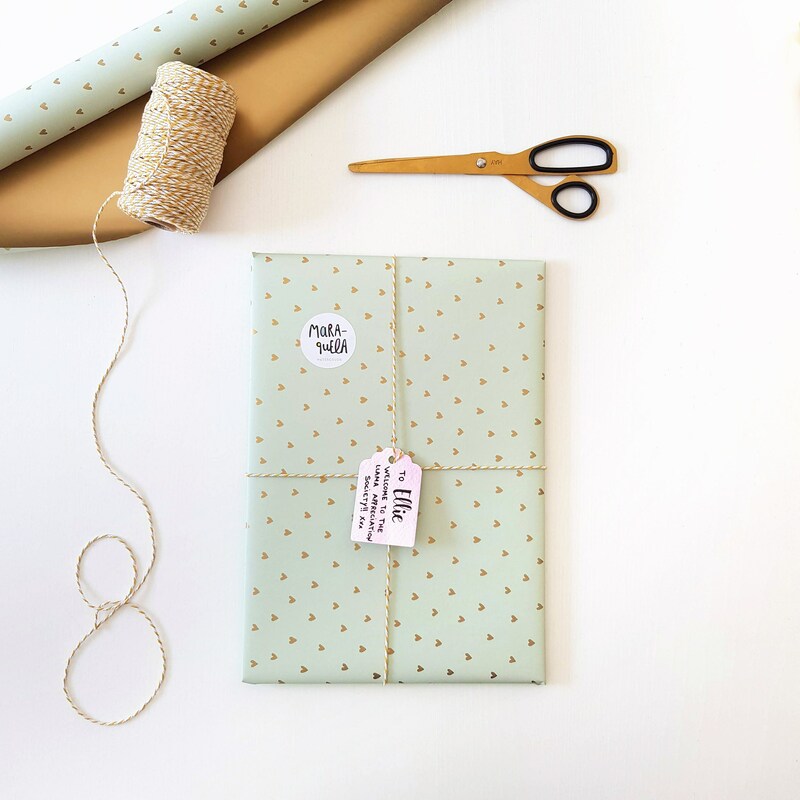 • Para personalizarla con el nombre que deseas solo tienes que especificarlo en "notas al vendedor" durante el proceso de compra. 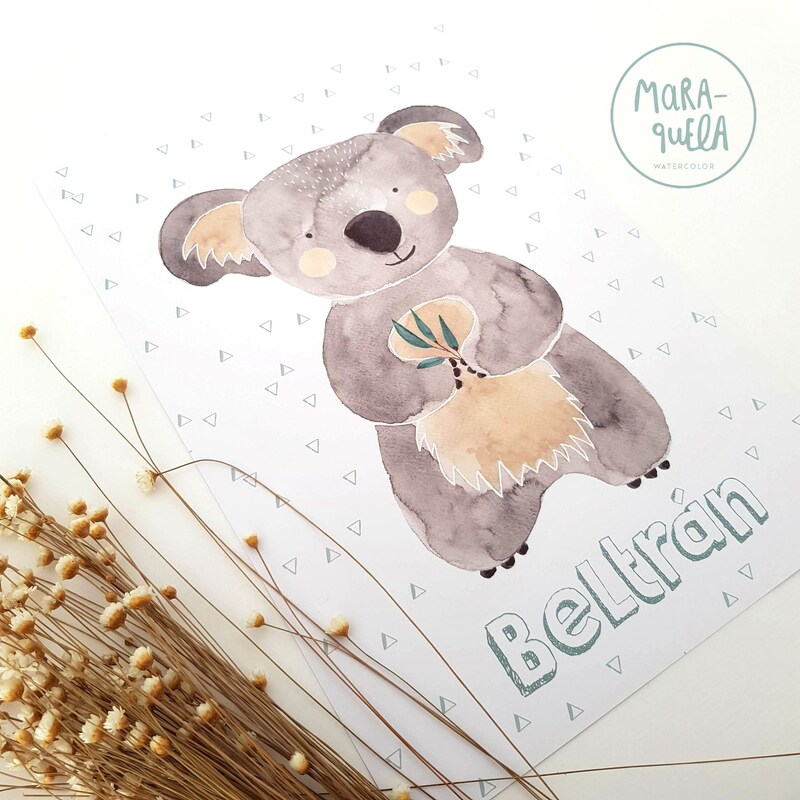 • Las impresiones (ART PRINT) son realizadas profesionalmente en papel de alta calidad y alto gramaje que permiten mantener las tonalidades y sombras de mi acuarela original. • Todas nuestras láminas son empaquetadas adecuada y cuidadosamente en sobres acolchados o tubos de envío dependiendo del tamaño, evitando de esta forma cualquier tipo de daño. • Los envíos a España (península) y Portugal son realizados a través de mensajería, para el resto de países el envío se realiza a través de correo postal. • Ninguna lámina se vende con el marco. • La artista conserva todos los derechos de reproducción y derechos de autor. • Si te interesa personalizar este articulo, por favor, contáctame. 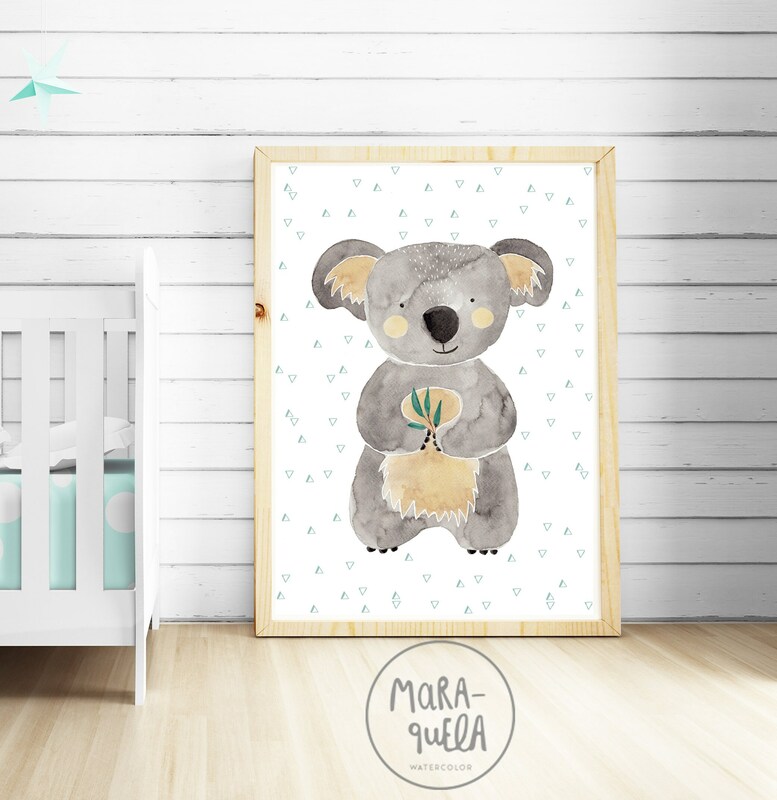 • Koala illustration in watercolor, custom print for babies and kids, with name (optional). • Beautiful colors: gray and teal shades. • To customize you just have specify it in "notes to seller" during at checkout. 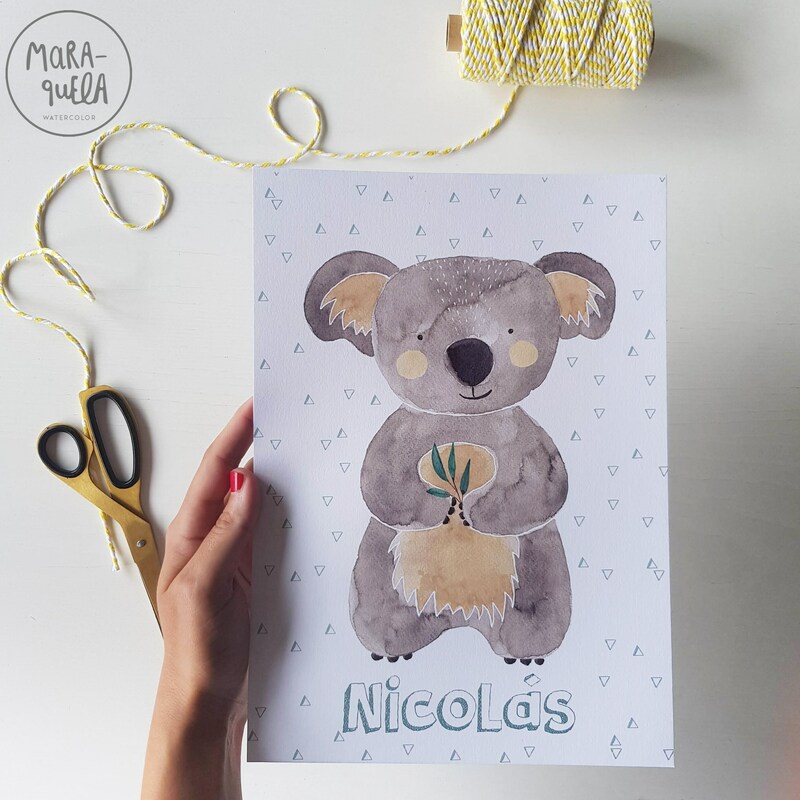 • The prints are printed professionally on high quality archival paper and heavyweight. • The print retains the look of original painting so the image has all the tonalities and hues of the original watercolor. • All our items are packaged properly and carefully in mailing tubes, so that any damage is avoided in the delivery process. • All shipments are made via the postal service, registered mail (tracking number included). • All Prints are UNFRAMED. • All original paintings or prints are made on high quality paper. • Artist retains all reproduction rights and copyrights. 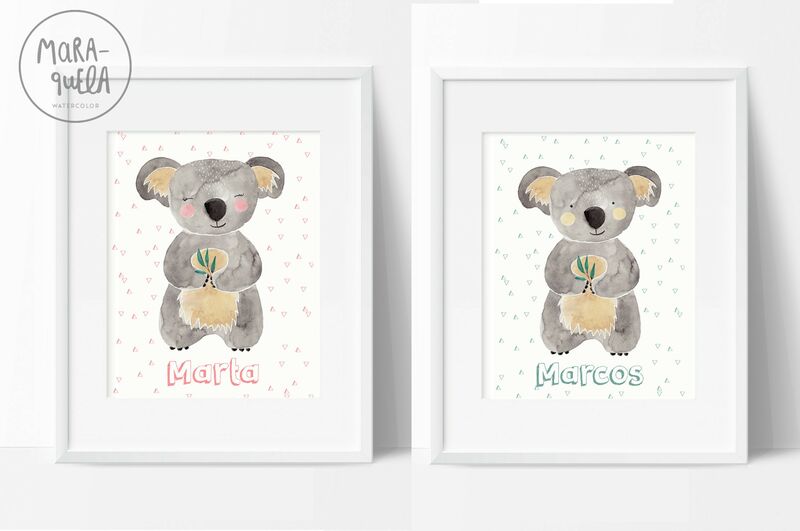 • If you are interested personalize this item, please feel free to contact me. If you are looking for one, please do not hesitate to contact me through the conversation button or the request custom order button. 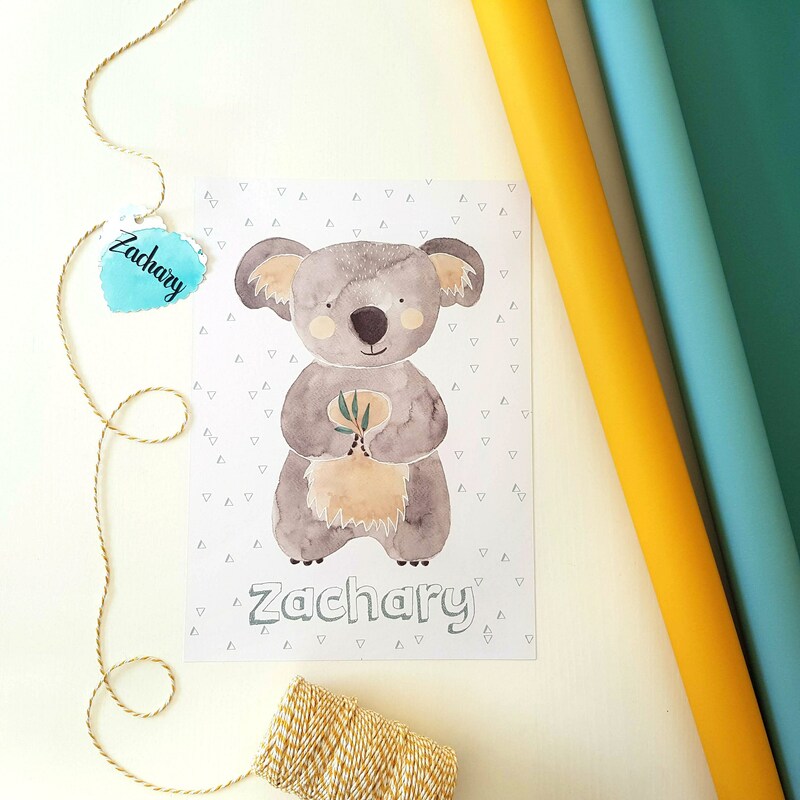 I will then work with you on what you are looking for and create it and when we agree on a price for the item, I will list it in my shop reserved for you in your first name for you to purchase. Custom Orders require payment in full upfront including shipping and handling before item will be completed and sent. What is the shipping method? I ship Monday to Friday except public holidays. I make shipment through the postal service in Portugal. Once I receive your payment, your item will be carefully packed to prevent it from being damaged or bent in shipping. 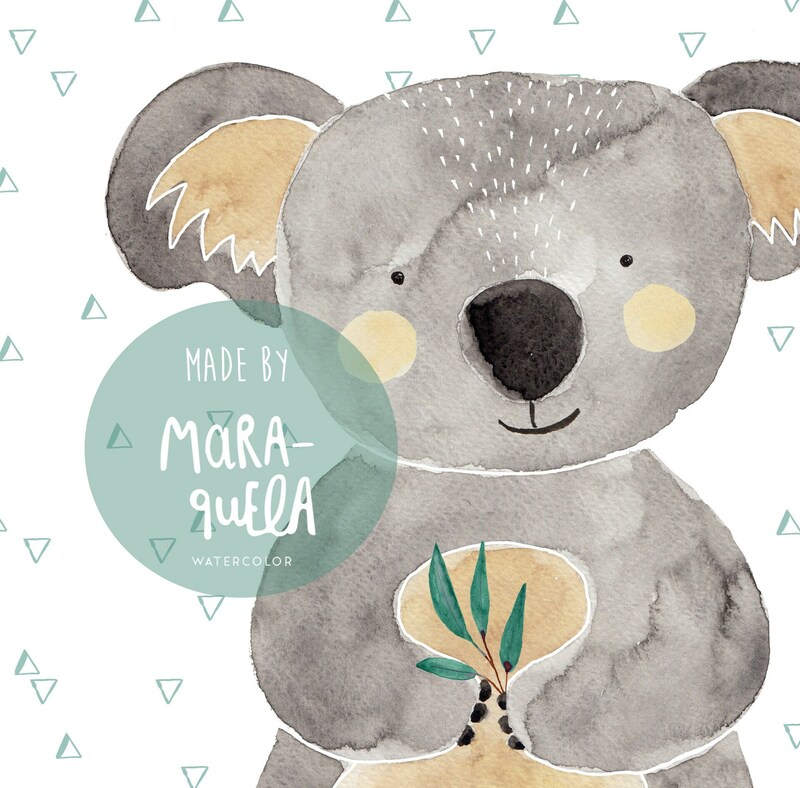 In addition, the item will be sent through the postal service in Portugal, as REGISTERED shipping. So, when your order is shipped, I will tell you the tracking number so you can track your order during shipping. Comunication with seller was really good, the illustration is beautiful and arrived soon. 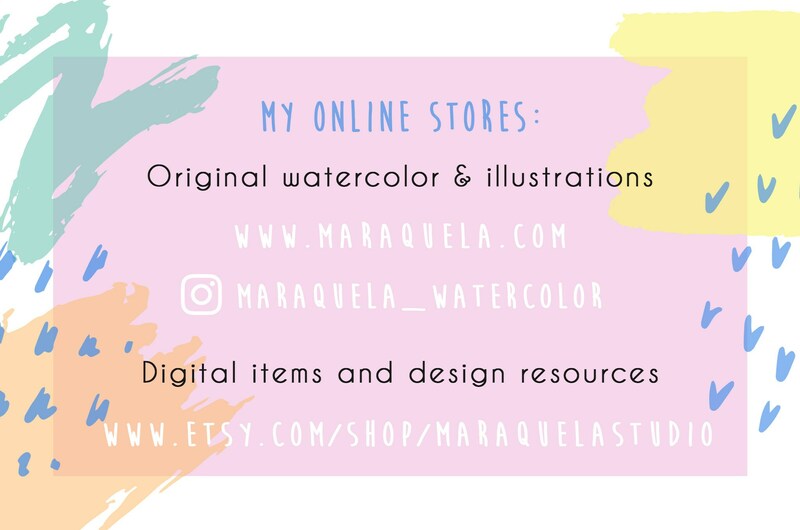 If I could, I would buy everything in Maraquela’s shop ;) Highly recommended !!! !